612 pages | 103 B/W Illus. "[T]his book is an indispensable, comprehensive review of all things having to do with ocean policy and management. It is factual, international in scope, and full of information on the latest geopolitical discussions, agreements, and developments. Topics range from the globalization of governance of the oceans, fisheries, and natural resource development, exclusive rights of national maritime boundaries, and marine spatial planning. Each chapter is written by an expert in the field and followed by a substantial reference list that includes key policy documents. If these documents were not presented within this work, they could be difficult to be aware of or to locate. 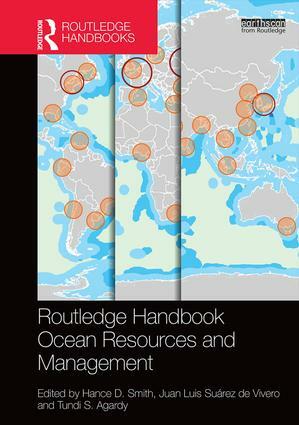 Because the book is so full of information (much of which is linked), the index serves as an extremely useful tool that helps readers locate information on topics or documents that cross over among chapters; thus, a complete picture of the complex interrelationship of human interaction with oceans and their resources can be formed." Hance D. Smith was a Reader in the School of Earth and Ocean Sciences at Cardiff University, UK until 2011. He is Editor of Marine Policy, the leading academic journal of ocean affairs. His academic interests include marine geography, marine resources and environmental management, and marine policy. Juan Luis Suárez de Vivero is a Professor in the Department of Human Geography, University of Seville, Spain. His special interests are social science aspects of maritime policy, ocean governance and integrated coastal zone management. Tundi S. Agardy is Executive Director of Sound Seas, a US-based group focused on marine protected areas, ecosystem-based management, and coastal planning. She is author of Ocean Zoning (Earthscan, 2010).